“Private Soldiers” tells the story of the men who served in the Wisconsin Army National Guard’s 2-127th Infantry during Operation Iraqi Freedom. Through images, interviews, and letters, the book chronicles the life of Wisconsin’s citizen-soldiers, the missions they conducted, and the places they called home. 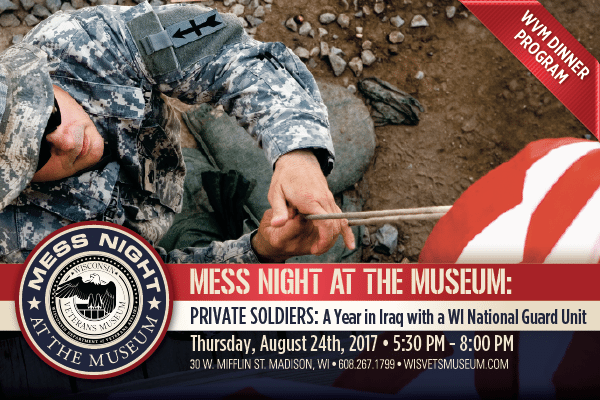 Join Staff Sergeant Joseph Streeter, co-photographer of “Private Soldiers,” 10 years later as he shares his perspective about a year in Iraq and the dedicated service and sacrifices of these Wisconsin veterans.